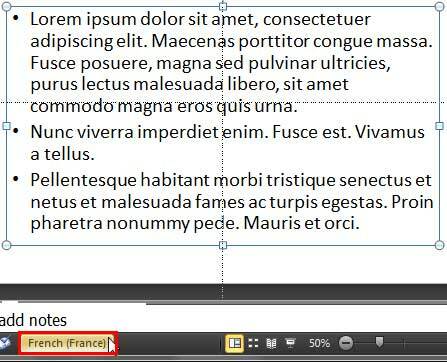 Learn how to set proofing language for selected text containers in PowerPoint 2010. First select the text container you want to alter the proofing for, as shown in Figure 1. Tip: A text container is any of these three slide objects that can include text: text placeholders, text boxes, and shapes. Click the Language option on the Status Bar (highlighted in red in Figure 1). 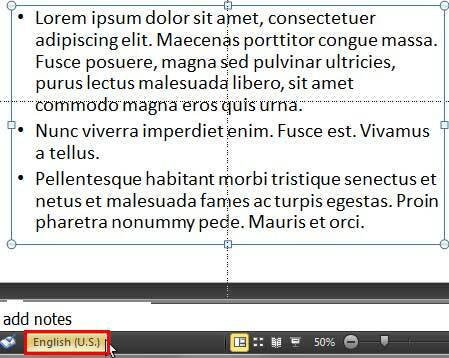 Note: Cannot see the Language option on the Status Bar -- see our Language Options on the Status Bar in PowerPoint 2010 tutorial. This brings up the Language dialog box that you see in Figure 2. 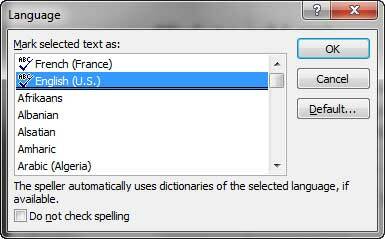 Scroll down to select an installed Editing Languages -- installed languages can be recognized by the check mark preceding them as shown in Figure 3. Choose the language you want to use for your selected text container. Thereafter click the OK button. You will see that the Language option on the Status Bar has now changed, as shown highlighted in red within Figure 4 (compare with Figure 1). Similarly, change the language for any other text containers in your presentation. Now when you spell check your slides, the text in the containers will be proofed for the language set for proofing. First select your text container for which you want to change the proofing language. Access the Review tab of the Ribbon, and click the Language button highlighted in red in Figure 5. This brings up a small drop-down menu shown in Figure 6. 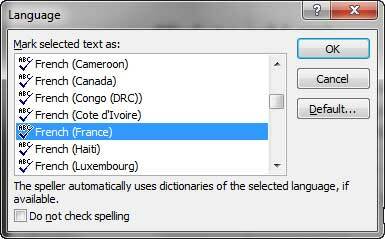 Choose the Set Proofing Language option -- this brings up the same Language dialog box that you saw in Figure 2. Make changes to the proofing language, as required -- repeat the process for any other text containers within your presentation.